Please do not serve this to people on diets. 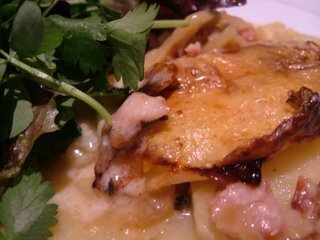 Tartiflette is a dish from the Savoy region of France, where they take their dairy products very, very seriously. Despite its extreme good looks and fantastic taste, it’s not actually a traditional recipe – it was invented in the 1980s by the union of Reblochon cheesemakers as a way to popularise the cheese. Since then, it’s become popular throughout the region, and different recipes have proliferated. This is my take on it. Chop the shallots into small dice, and cut the bacon into dice the same size. Saute in a little butter until the shallots are sweet and the bacon browning at the edges. Set aside. Peel the potatoes and slice them as thin as you can. (My new mandoline has made this the work of a couple of minutes, and I’m yet to injure myself on it, so I’m still recommending you go straight to the cookware shop and buy one. A plastic Japanese one is very inexpensive – mine was £5 – and works splendidly.) 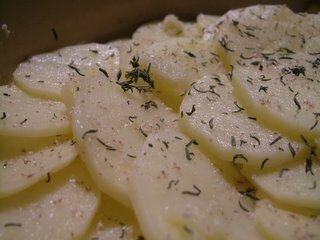 Arrange one overlapping layer of potato slices in the bottom of a heavy baking dish which you have buttered generously, then sprinkle over the thyme, a grating of nutmeg and half of the crushed garlic. Scatter over half of the bacon and shallot mixture, then spread half the crème fraîche over the top. Repeat with another layer, then put a final potato lid on the top. Slice the cheese in half along its equator, and cut each half into quarters. Arrange the pieces on top of the dish. 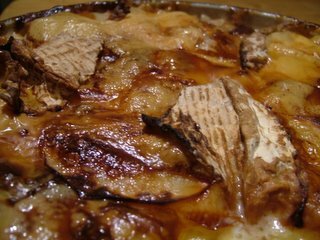 Pour the Marsala over the dish, dot with butter, season (don’t use too much salt – you’ll get plenty from the bacon and the salty cheese) and bake in the hot oven for an hour, or a little longer – test to make sure that the potatoes are tender. It’s advisable to put a tray under the dish to catch any drips. This is very rich. Make sure your salad has a tart dressing to offset the extreme creaminess of it all, and dig in. I became involved in a conversation yesterday about the horrible habit certain British supermarkets have of putting slices of smoked salmon on cubes of rice, and calling the results sushi. It got me thinking . . . and thinking . . . and thinking, mostly about where I could get my hands on some sushi, rightnowthisminute. Fate smiled on me in the morning when my parents rang and asked whether we’d like to accompany them to Oriental City in Edgware (see this earlier post for address details and ways to get there). There’s a big, Oriental food court there, and while I usually gravitate towards the Malaysian or Vietnamese stalls, there’s also a stall called Japan Food which I hadn’t tried before. A sushi chef, knife in hand, napkin on head, was looking busy. I went to ask him whether he had any uni, and he nodded, but made it clear he didn’t speak any English and pointed me at a lady in an apron, who took my order. So far so good. 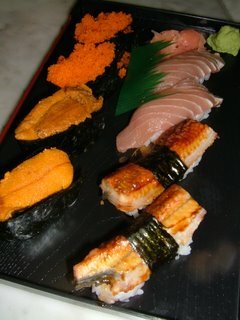 I asked for four kinds of nigiri sushi (nigiri is the kind of sushi which is made from a bullet of hand-shaped rice with a piece of raw or cooked fish, shellfish, omelette or other ingredients neatly placed on top). 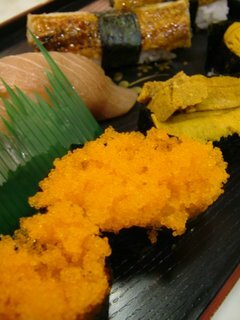 Tobiko (flying fish roe), are a crisp, tiny orange roe which are salted and sometimes flavoured before use. Uni is fresh sea urchin. Unagi is a cooked, fatty freshwater eel, grilled in a teriyaki sauce, and I think I am probably safe in assuming that you all know what tuna (maguro in Japanese) is. They had everything I wanted, which was cheering. It took them twenty minutes to prepare the eight pieces of sushi. This is a bad sign; the chef was working slowly, which is unusual in a trained sushi chef. Worse still – as you can see from the photos, the sushi on the plate was . . . messy. 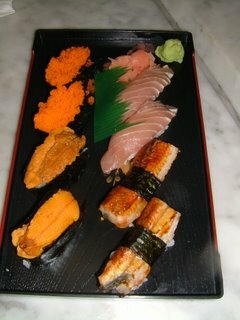 Tobiko had spilled off the rice and out of its nori (seaweed) wrapping, and the unagi didn’t fit on its rice. This isn’t usual. 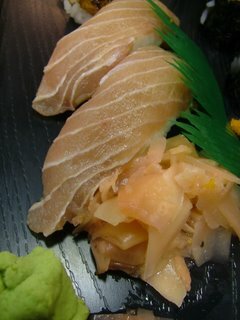 The presentation of jewel-like sushi nigiri is important, and it’s a matter of pride for the chef. My chef was clearly not having a prideful day. First, I took a tobiko nigiri. Not promising.This wasn’t a good example of the roe; it was oversalted and had a lot of gaspingly obvious extra flavouring. (Good tobiko is flavoured where it’s produced, but not with a sledgehammer and a shovel like this was.) 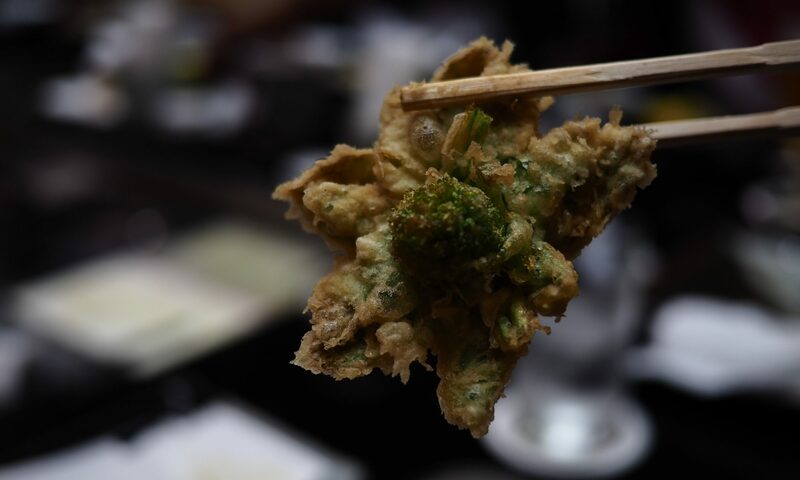 The nori holding it on top of the rice hadn’t been toasted to make it tender to the tooth, and it rustled around in the mouth like a salty Mars Bar wrapper. 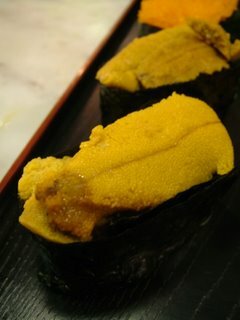 Fresh uni is very delicious stuff; if you like the taste of the sea you find in a raw oyster, you’ll love uni, which is firm but creamy, and tastes of sweet ozone and fresh seaside breezes. This was . . . fresh-ish. (I should have asked to see it before ordering.) Fresh uni is sweet, and it’s paler than this. Mine was still seaside-tasting, but a little bitter, and darker than it should have been. Chewy nori again. Disappointing. The tuna – blah. At least it was quite nice and fatty. It was pre-sliced (how long does it take a guy with a sharp knife to peel two rectangles off a slab of muscle to order? ), and had been sitting around for a while, a bit damp. And a horror was lurking beneath it – the rice hadn’t been mixed with the sugar and vinegar mixture that flavours it properly, and I got a mouthful of vinegar. I was beginning to feel seriously miffed. Good unagi is one of my favourite things in the world. It should have been grilled moments ago, its hot fat crisping the skin and making the flesh tender, painted with a sugary-salty sauce and conveyed straight to the waiting mouth. This crisping makes the skin friable and easy to bite through. I’ll leave you to guess whether this was good unagi. You might benefit from some pointers: it was stone-cold. It was chewy. It was about as crisp as a well-sucked whelk. All is not lost. Next month, I’ll be visiting (and blogging from) an extremely good sushi restaurant in California, which does better and fresher sushi than any I’ve tried in some of the very expensive Japanese restaurants in London. I’ve started planning holidays around the opportunity to go there. Watch this space. 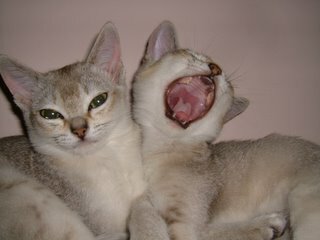 Thanks to Clare at Eatstuff for organising Weekend Cat Blogging again. Here are Mooncake and Raffles relaxing to some karaoke. Raffles is pleased with his Diana Ross impression. 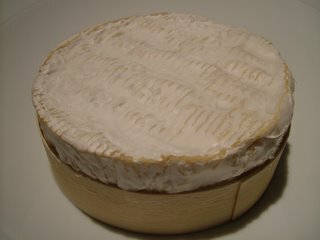 This week, we bought an Epoisse (an exceptionally stinky French cheese) and ate it for dessert. I wish I’d had my camera to hand – the kittens, normally not much moved by human food, made up their minds that it was a particularly sticky and inert kind of delicious mouse. 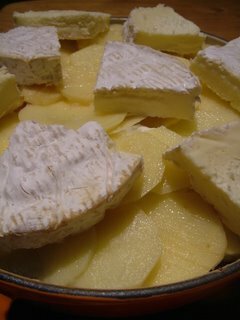 We ended up giving them a small slice to stop them trying to dive into our plates – a slightly foolish decision, given they syrupy stickiness of a ripe Epoisse, and the horrendous smell of an Epoisse-y kitten who hasn’t washed all the cheese off her shoulders a couple of hours later. I leave you with a cuter picture. 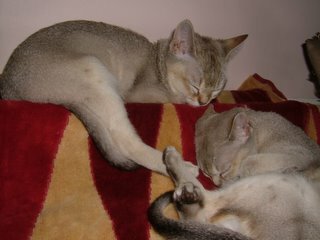 I found them dozing on the lovely Mulberry towel Mr Weasel’s parents bought me for Christmas when I’d left it to dry on the radiator. Suits them, doesn’t it? 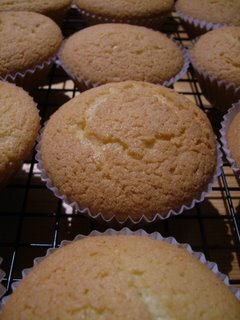 These little buttercream-filled fairy cakes were Mr Weasel’s favourite when he was a kid. 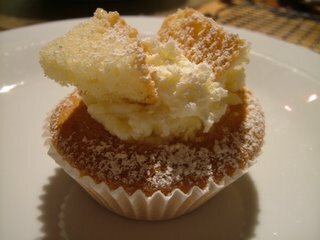 He’s the baker in the house, and on getting home today he ran for the handmixer, claiming an attack of cake nostalgia. He claims that being a computer scientist has given him an unparalleled skill for following instructions, and says this is why he’s so very good at baking. I think he was visited by a buxom, greasy-fingered fairy-godmother with cake crumbs in her hair, a wooden spoon for a wand and golden syrup down her apron when he was in his cradle, but who am I to say? Beat the lot together with a handwhisk until pale and airy, divide between 18 cake cases and bake at 200°c for around 20 minutes, until golden. Use the Mr Weasel Aural Method to work out whether your cakes are done – listen to them when they come out of the oven (get close, but don’t burn your ear). If the cakes are hissing and popping, they’re not done. Put them back in for a few minutes and try again. When the cakes are ready, remove them to a metal rack to cool. When the cakes are cool (important, this coolness; a warm cake may be crumbly, but a cool one will slice readily), slice off the top and cut it in half. 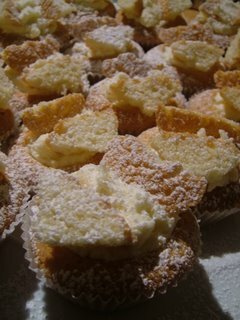 Put a teaspoon of the icing on the cut cake surface, and put the half-slices of lid back on to look like little wings. Open mouth, insert cake and reminisce about children’s parties. This is a cold-weather otak-otak. In Malaysia, you’d be wrapping your fish mousse in banana leaves and grilling the filled leaves over a charcoal fire outdoors. In England in January, you’re going to be wrapping it in home-made banana leaves (tin foil and greaseproof paper), and, unless you’re the masochistic sort who doesn’t mind hauling the barbecue out in the sub-zero night, dry-frying in a pan on the hob. Put all the sambal ingredients in a blender, and whizz until they’re a paste. Set them to one side. This will pong – blachan is very strong, and when it’s raw has a distinct and non-charming smell of dead things. Suspend your disbelief and keep cooking – it starts to smell better very soon. Remove your finished sambal to a bowl. 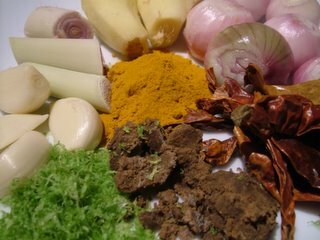 This sambal can form the base to a lot of Malaysian recipes – it’s strong, and it’s delicious. You can vary the amount of chili that you use depending on taste (I used a lot here – these are chilis that I bought in Malaysia last year, and they’re not particularly strong). As you become more used to the flavour, you may find yourself wanting to use more blachan. It is very strong – I keep ours in the garage, in case I offend the in-laws. 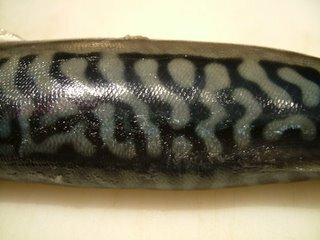 Remove the skin and the spiky backbone from the mackerel. In Malaysia, this would be a threadfin – Sainsbury’s don’t carry threadfin, so you’re stuck with mackerel. Any meaty, oily fish will work well. If you have two kittens, the skins will find a good home if you chop them up and stick them in a bowl. 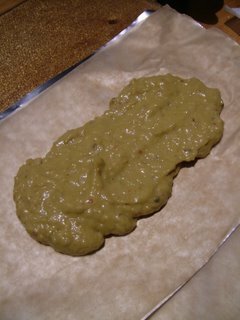 Put the flesh in the food processor with the water and blend until you’re left with a pale puree. Add the coconut milk, the sugar, the eggs, coriander and salt. Pulse until everything is combined, then add the sambal you made earlier and process until you end up with a thick paste. Cut rectangles of foil and greasproof paper measuring 15 x 30 cm. Put a piece of greaseproof on top of a piece of foil and lay three dessertspoons of paste down the centre. Fold everything up carefully. It’s not meant to be airtight; the packets are there to help your otak-otak both steam and grill, so you’ll have a lightly steamed mousse with a golden, grilled bottom. Put your little packets in a frying pan without any oil over a medium flame, and toast them for between ten and fifteen minutes, until the mousse is wobbly but firm. Serve with rice and imagine you’re sitting in a Malaysian restaurant with zinc-top tables and dripping rainforest outside. Outside it’s dismal. 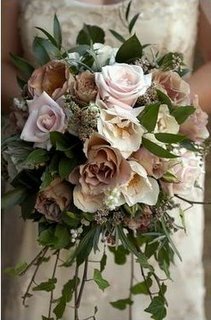 The garden is kitted out in a million shades of brown and dark grey. So how is it that vegetables at this time of year are so brightly coloured? Right now, I can buy fresh, dark red beetroot, bright orange butternut squash, and darkest green winter herbs like rosemary and sage. The vegetables in season at this time of year have an added benefit – they’re full of the sugars they’ve been saving up all year, so they are sweet and delicious. Beetroot is a much maligned vegetable. Unsurprising, really; I can’t think of many things which benefit from being drowned in malt vinegar. We used to be served it at school, and God, it was revolting. The holiday in France when I was 9, where I was served a plate of crudites including some raw, grated beetroot, was a revelation. 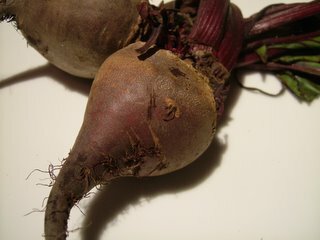 Beetroot in its natural state is sweet, juicy and earthy. If you’re only used to the pickled stuff and you see a bunch on sale raw, take it home and experiment with it. You may give yourself a delicious surprise. 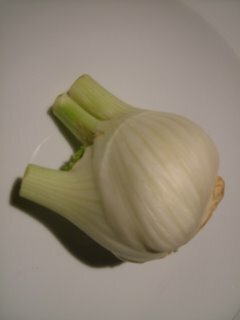 Whole bulbs of fennel are on sale at the moment as well. Sweet and fragrant, fennel cooks to a delectable crunch, and here, where it’s roasted in white wine and goose fat, it’s just beautiful. I’ve used sweet onions (Vidalia) – these onions are not as easy to come across in the UK as they are in America, but Sainsbury’s are carrying them at the moment with a recommendation that you use them in salads. They’re so full of sugar that they roast to a caramel perfection. 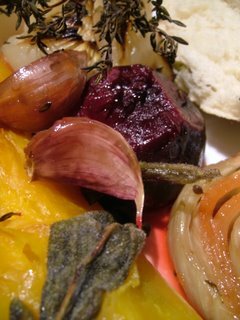 I’m roasting a couple more onions in this than we’re likely to eat tonight – they’re excellent cold too. Wash the beetroot and cut the tops and bottoms off. Cut ends like this will allow the edges to catch and caramelise. 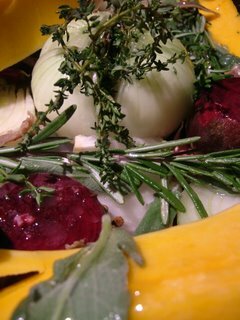 Cut the squash into four lengthwise, and slice the fennel roughly (into about five pieces). Divide the garlic into cloves – don’t peel them. Peel four of the onions and trim the roots and tips off, then push a knife through them so they are nearly quartered, but still held together at the bottom. Stuff each nearly-quartered onion with thyme, making sure there’s a good amount of salt sprinkled over the cut surfaces. Chop the rest roughly. Put all of the vegetables into a baking tray with the anchovies on the bottom. The anchovies will not make the dish taste fishy, but they’ll give everything a rich, dark background flavour. Pour over the wine and drizzle with whole coriander seeds, maple syrup and goose fat. Strew the rosemary and the thyme over the top and put in the oven at 180°C for an hour and a half, or until the edges of all the vegetables are golden brown. The wine and juices will have made an alarmingly pink sauce. Serve the vegetables with some crusty bread to mop up the liquid, and drink the rest of that bottle of wine. Being related to a doctor is a wonderful thing, but those of you who aren’t can buy your own drugs paraphernalia at the chemist’s. Nothing is guaranteed to concern your guests more than arriving to find you injecting home-flavoured vodka into a couple of giant punnets of cherry tomatoes. These little guys are, by design, very sharp. Be sure not to have any vodka yourself before you start this; you’ll need all your faculties clear and lucid in order to avoid spicy vodka-finger. I made a Bloody-ish Mary base by mixing nearly half a small glass of unflavoured vodka with half a glass of lemon vodka, the juice of two limes and two teaspoons of wasabi. You need lots of spicing; only a little of the mixture goes to flavour each tiny tomato. 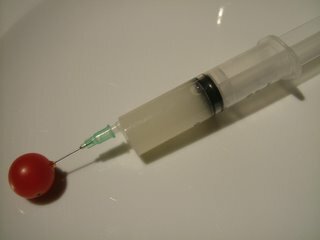 Carefully insert the needle at the place in the tomato where the stalk was attached. Squeeze down on the plunger gently until you can feel the little tomato swell and become stiff. Serve in a great big bowl, warning guests that these are not precisely tomatoes. 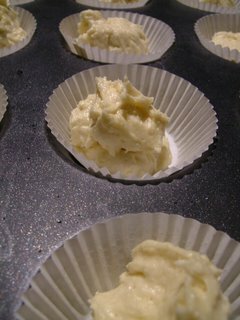 Simmer the chopped garlic in the butter for fifteen minutes until it is soft, and the butter is infused with the scent. Use a rolling pin to roll flat the slices of bread, and cut out fifty circles of the squashed bread with a cookie cutter. Brush each side with the garlic butter and bake in a hot oven for around 15-20 minutes until the little rounds are crisp and brown. Once they have cooled, you can keep the garlicky bases in an airtight box for a few days, and they won’t lose their crispness. Score the skin of the tomatoes in a little cross at the base, and pour boiling water over them straight from the kettle. This should loosen the skins so that you can peel them off easily. Chop them into four and throw the seeds away. Dice the tomato flesh. 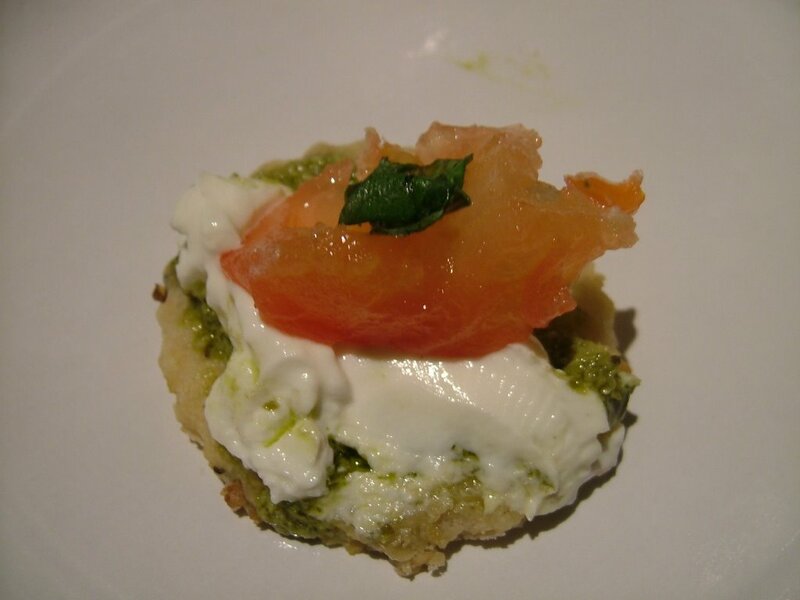 Spread each crisp round with a layer of fresh pesto, a layer of goat cheese and a sprinkling of diced tomatoes. Garnish with basil and eat quickly to keep the crunch. Gastronomy Domine has reached the finals in the Best of Blogs awards – voting will, apparently, start soon. Watch this space for more details. Meanwhile, I’ve dropped some photos from the previous post. I’ll replace them later (the originals are still on my camera), but for now, please imagine what meatballs would look like if blessed by the Extremely Good Meatball Fairy. They looked just like that. Sometimes, the best recipes come about by sheer accident. 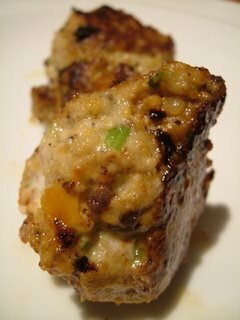 This was one of them, and if you make anything from this blog this month, you really should think about making these moist little meatballs – they’re fast, completely delicious and very easy. So easy I feel a little ashamed. Frickadellen, a Teutonic cross between a meatball and a burger, are little patties made from white meats, usually veal and pork. I had been poking around in the fridge, wondering what on earth to do with half a bowl of olives, some randomly purchased vegetables and some bread which was on the verge of going stale, and came up with this. The results really had no business being this good. Clearly the little god who works the refrigerator light was smiling on me. Try making these the next time you feel the need to sacrifice a wilting lettuce and an about-to-burst tomato to him. Skin the sausages, and put them in the food processor with everything except the chicken breasts, and whizz until you have a rough paste. Add the chicken breasts and pulse until they’re chopped roughly, mixed in with the other ingredients. Form round patties about the size of a ping-pong ball and saute (I used some bacon fat left over from breakfast’s patented hangover cure, some very crispy bacon sandwiches). 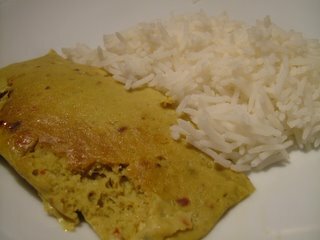 Turn regularly for between 10 and 15 minutes, and serve hot with rice and a salad. 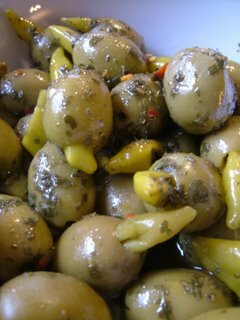 The olives keep everything moist (use black or green ones preserved in oil, not in salt, and make sure they’re de-stoned); the coriander seeds pop, full of flavour, in your mouth; the bread gives the meatballs a beautifully tender texture; and the red pepper makes everything sweet and juicy. Delicious. My guilt at the easiness of preparing these meatballs was soon realised. I had a sneaking suspicion that food this good should involve suffering. It just wasn’t my suffering – immediately afterwards, Mr Weasel, washing up, nearly chopped his thumb off on the Magimix blade. It now has three macho-looking stitches (administered by my Dad, a GP with a delicate touch and a good line in sympathy for the poor sod who has to live with his daughter). No photographs, in that I am hoping that you will want to keep coming back to read this blog, and I suspect you’ll be put off by extreme clinical detail. Happily (I think), Mr Weasel has said that he’d cheerfully chop most of the other thumb off if it means he can have these Frickadellen a second time. I think that’s probably as good a recommendation as I’m going to get. Enjoy these, but be careful about what sharp-edged, curved bits of steel might be lurking under the bubbles in your sink afterwards. 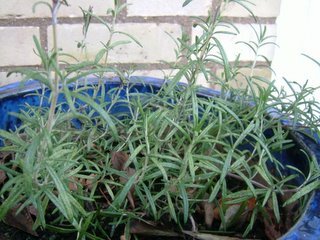 It’s Sunday – time for Weekend Herb Blogging. Thanks to Kalyn for organising it again. 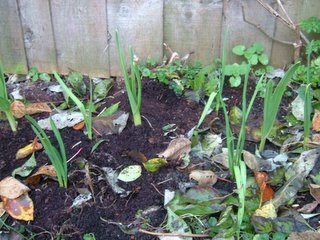 You might remember my day in the garden back in October, when I planted something approaching a metric tonne of garlic in the back garden. 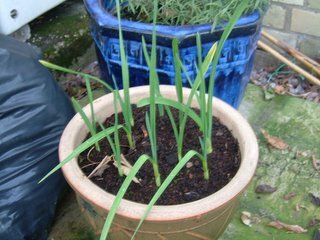 It’s now grown leaves, and seems to be doing well – here is some of the garlic which went into beds, and the garlic which went into a pot (the idea here is that I should be able to compare the two in the summer and see which planting method worked better). They’re doing very well – I’ve not had to mulch them, since garlic is frost-hardy down to about -10°C. The larger plants among the shorter stems of garlic in the top picture are the gigantic elephant garlic. The plants will need fertilising in the early spring, when the bulbs in the ground will start to swell and grow. Can’t wait until they’re ready to eat. Behind the garlic in the bottom picture is a pot of rosemary. Nothing too unusual about that, you might think, but this is, for me, a very special plant. The rosemary came from my wedding bouquet in 2004. I’d asked the florist for rosemary in among the roses and lily-of-the-valley to reflect the cooking I do – and when we went away on our honeymoon my Mum took the rosemary out of the bouquet (yes, that is me in the picture – if you look closely you can make out the rosemary in among the flowers) and was able to get it to sprout roots in some damp compost. She potted it up and gave it to us when we got back. The rosemary is growing fiercely a year and a half later (a Spanish friend tells me that a strong rosemary plant outside the house means that there’s a strong woman inside the house). I haven’t cut any of it to cook with yet, and won’t until it’s a bit bushier. The plant is a brilliant reminder of a wonderful day, and it should last, carted around in its pot from house to house as we move, as long as I do.